MIT’s fusion program has fallen on hard times, but that hasn’t stopped it from smashing world records and keeping the dream of limitless, carbon-free energy alive. At an International Atomic Energy Agency summit in Japan this week, researchers involved with MIT’s Alcator C-Mod tokamak reactor announced that their machine had generated the highest plasma pressure ever recorded. 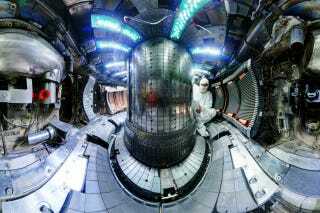 Fusion is a futuristic energy source physicists have been chasing for about fifty years. The idea, in a nutshell, is heat atoms up to a hundred million degrees or so, at which point they rip apart and become a free-flowing mess of protons and electrons called a plasma. Then, harness the tremendous bursts of energy released when stripped atomic nuclei collide. The problem is that in order to get more energy out of a fusion reactor than we put in, we need to achieve a self-sustaining plasma, one that burns on its own with only minimal energy inputs. But plasmas can only reach this so-called “steady state” if they can be contained, and extraordinarily hot atomic soup does not like to be contained. It likes to splatter everywhere. The big payoff in fusion may not come for decades, but let’s remember what it is: Star power. There are a few different routes one can take to try and promote a steady state plasma. MIT’s donut-shaped tokamak reactor was focused on magnetic confinement, that is, using extremely powerful magnetic fields to force atoms close together. And, seeing as this method just bagged itself a new world record for a plasma pressure of over two atmospheres, it’s probably not a bad direction for fusion enthusiasts to keep pushing. Unfortunately, the record was hit right before the Alcator C-Mod reactor, the world’s only compact, high-magnetic field fusion reactor of the tokamak design, was pulled offline for good. After 23 years of operation, the Department of Energy has canceled its support for MIT’s record-smashing device due to the fact that a gigantic, $30 billion superconducting reactor in France, called ITER, is now devouring the lion’s share of our fusion research dollars. Depending on who you talk to, ITER is either the future of fusion energy, or a bloated, bureaucratic mess that’ll stall progress in the field for the next twenty years. Either way, MIT’s fusion program, which has over the years attracted some of the most brilliant minds in plasma physics, has effectively been castrated. According to Greenwald, the university is now seeking to private investors to jumpstart a new line of research in low-cost, compact fusion reactors, which grad students drew up designs for last summer. It’s also applying for more government funding to study different aspects of the plasma confinement problem, including interactions between hot plasma and the more ordinary materials lining a fusion reactor wall. The latest fusion milestone is a bittersweet one, and I stand by my belief that the real problem with fusion energy is not an intrinsic scientific barrier. It’s whether we can give academics the time and resources they need to tackle some enormous technological challenges, without the constant fear of losing funding support. The big payoff in fusion may not come for decades, but let’s remember what it is: Star power.